The best Hand-Pulled Noodles in Beijing - Biang biang Noodles in Beijing - where have we found them! Beijing is a huge city with a lot of restaurants with traditional food. In those restaurants, you can get dishes almost from every region in China. For me, it was pretty difficult to choose where we should eat, mainly because we were planning to spend there just three days. I was not expecting the noodles in china will be this good, but they were! 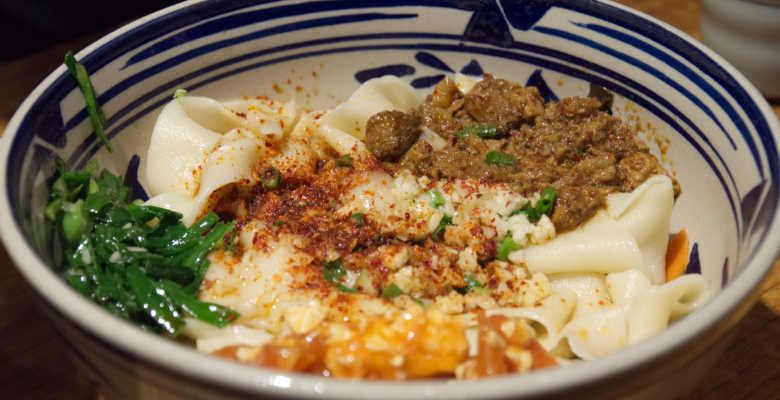 On this trip we have eaten the best hand-pulled noodles in Beijing! In this case, we have decided to book a food tour, which took place on our arrival. The food tour with Zeben from UnTours was terrific! He indeed took us to places which we wouldn’t find on our own. Especially in China where the language barrier is a problem. We have eaten and drunk many delicious dishes, and in this blog, I would like to show you some of the traditional food that you should try in Beijing. The restaurants/stalls are on the street what makes them very easy to find and try few things in one go! Biang biang noodles at Qin Tang Wei Dao were undoubtedly a highlight. That was the first time when we had hand-pulled noodles, and I will never forget the taste of them! The noodles were thick, heavy and so delicious! The sauce was a little spicy and sour, and the ingredients were perfectly balanced. I would recommend that dish to everybody who comes to Beijing and believes me or not, but we did come to the same restaurant the day after to eat the same meal. This is how good the noodle was. Jianbing is a Chinese pancake that they eat for breakfast. Inside the pancake, there is an egg, spring onions, chili sauce, soybean paste and this crunchy thing that makes the pancake unforgettable. The pancake is very different to this what we know as a pancake in Europe, and I am glad we have tried it! This pancake will seriously blow your mind. Donkey burger became very popular after the Chinese first built the trains and they stopped using donkeys for transportation purposes. It’s a pretty sad thing, but let’s face it, a donkey is an animal and people eat animals. Donkey Burger is a very crunchy sandwich filled with green peppers, coriander, and chopped donkey meat. The meat tasted like beef for me. I wouldn’t say it was the best sandwich I have ever had, but it was perfect to try this. 128 Dongsi Bei Dajie, near Dongsi Shisan Tiao.